By the first half of the 1930s the Royal Tank Corps had amassed much experimental and operational data with its first series of light tanks. On the whole it was satisfied that the light tank had a valuable role to play, though operational experience was limited to parts of the world where there was no effective opposition. It was clear, though, that while the monocoque hull, powerplant and running gear of the Mk IV still had value, the vehicle was limited in operational capacity by its one-man turret and its single machine-gun. An important step was thus taken with the 1935 adoption of the Light Tank Mk V. This was another Vickers-Armstrongs product, and was in practical terms the hull of the Mk IV with an enlarged fighting compartment surmounted by a new two-man turret. This was the first such unit fitted on a light tank, and for ease of traverse was mounted on a ball race: the armament comprised two Vickers machine-guns, one of 0.303-in (7.7-mm) and the other of 0.5-in (12.7-mm) calibre, and the turret was surmounted by a commander’s cupola. The Mk IV had been criticised for being nose heavy, and in the Mk V the weight was redistributed to remove the problem. Power was provided by a Meadows ESTL engine, whose 88 hp (65.6 kW) provided the 9,300-lb (4218-kg) Mk V with a maximum speed of 32 mph (51.5 km/h). In 1936 the Light Tank Mk VI entered service, and with it the stream of development by Vickers-Armstrongs on the basis of the Carden-Loyd Mk VII came to an end. The Mk VI was modelled closely on the Mk V with the turret increased in length rearwards to allow the installation of a radio set. The hull was also lengthened, and with an 88-hp (65.6-kW) Meadows ESTL engine this 10,750-lb (4876-kg) tank had a maximum speed of 35 mph (56.3 km/h). The type was mechanically reliable and cheap to produce, a combination that prompted large-scale orders: indeed, during the first month of World War II in September 1939 the British army fielded about 1,000 examples of the Mk VI family. Given the army’s lack of recent combat experience against a high-quality enemy, these modest little vehicles were extensively used in Europe, the Middle East and North Africa, suffering heavy losses because of their lack of offensive and defensive capabilities. As procurement of the Mk VI proceeded, improvements were incorporated as and when possible to produce a number of variants. These started with the Light Tank Mk VIA with a more powerful engine, a revised commander’s cupola, and modified suspension with the single track-return roller attached to the hull rather than to the forward bogie unit. Then came the Light Tank Mk VIB, which was the most extensively used British light tank of World War II: this reverted to the circular commander’s cupola from the octagonal unit of the Mk VIA or, in its Light Tank Mk VIB (India Pattern) subvariant, had no cupola. The ultimate model was the Light Tank Mk VIC with wider tracks and suspension units, roof hatches in place of the commander’s cupola, and armament comprising two Besa machine-guns, one of 15-mm (0.59-in) and the other of 7.92-mm (0.312-in) calibre. The final pair of British three-man light tanks were both Vickers-Armstrongs designs, the Light Tank Mk VII Tetrarch of 1938 and its successor the Light Tank Mk VIII Harry Hopkins of 1941. The two types were built only in small numbers, and were similar in concept, being based on four independently sprung road wheels of which the rear units served as drive sprockets and the front units as idlers; the steering was unusual, sharp turns being effected by the standard skid occasioned by braking of the inside track, but gentle turns being provided by pivoting of the road wheels to curve the tracks. The Mk VII was armed with a 2-pdr (40-mm) main gun plus co-axial 7.92-mm (0.312-in) Besa machine-gun in a trim turret. The armour thickness ranged from 4 to 16 mm (0.16 to 0.63 in) for a vehicle weight of 16,800 lb (7620 kg), and the 165-hp (123-kW) Meadows petrol engine provided a maximum speed of 37 mph (59.5 km/h). The Mk VII had little practical application in World War II, its only real use being the provision of armoured support for the airborne forces after arrival in the specially designed General Aircraft Hamilcar glider. The type was also used in small numbers as the Tetrarch Infantry Close Support (ICS) with a 3-in (76.2-mm) howitzer rather than 2-pdr (40-mm) turret gun. The Mk VIII was intended to overcome the Mk VII’s vulnerability by the adoption of armour that was both thicker and of superior ballistic shape: the maximum thickness was 38 mm (1.5 in), but the result was an increase in weight to 19,050 lb (8641 kg) and decrease in speed to 30 mph (48.3 km/h) on the 149-hp (111-kW) Meadows engine. Mk VIII production amounted to 100 machines, but fortunately for their crews these were never issued for service. Such, then, was the mainstream of British light tank development in the period between the two world wars. It is worth noting, though, that in addition to its Carden-Loyd derivatives for the British army, Vickers-Armstrongs also developed and produced two private-venture series of light tanks that enjoyed considerable export success. The first of these was the Six-ton Tank Mk E powered by an 87-hp (64.8-kW) Armstrong-Siddeley engine: the Mk E was built in two basic forms as the Type A with two side-by-side turrets each fitted with a single Vickers machine-gun (generally two 0.303-in/7.7-mm weapons but sometimes one 0.303-in/7.7-mm and one 0.5-in/12.7-mm weapon), armour to a 13-mm (0.51-in) basis and a weight of 16,125 lb (7314 kg); and as the Type B with a two-man turret accommodating one 3-pdr (47-mm) gun and a co-axial machine-gun, armour to a 17-mm (0.67-in) basis and a weight of 16,575 lb (7518 kg). Examples of this series were sold to Bolivia, Bulgaria, China, Estonia, Finland, Greece, Japan, Poland, Portugal, Romania, Siam and the USSR, and overseas development and construction resulted in the Polish 7TP, the Soviet T26 and the US T1 series. The second series was similar to the Light Tank Mk IV, though fitted with a bewildering array of armaments. Examples of the Light Tank Model 1933 were sold to Finland, Lithuania and Latvia; of the Model 1934 to Argentina, Belgium and Switzerland; and of the Model 1936 to China, the Dutch East Indies and the Netherlands. Further up the weight scale was the medium tank, for which the light tank provided reconnaissance and support: thus while the light tank was the inheritor of the World War I medium tank’s mantle, the medium tank succeeded the (battle) tank of World War I. Initial British efforts in the period after World War I were the Medium Tank Mk D, continuing the effort already well under way in the war, and the Light Infantry Tank. The latter was again the work of Colonel P. Johnson of the government’s Tank Design Department, and similar to the Mk D though smaller and lighter: its role was machine-gun support of infantry assaults, but work was ended in 1923 when the Tank Design Department was closed as part of the government’s financial retrenchment programme. By this time Vickers-Armstrongs had been invited to join the medium tank development programme, and its first design in this important field was the five-man Vickers Tank, produced in Nos 1 and 2 variants during 1921 and 1922. The overall configuration was akin to that of the Medium Tank Mk B, but the Vickers Tank sported a roof-mounted turret of domed shape surmounted by a commander’s cupola. The Vickers Tank was thus the first British armoured fighting vehicle with its main armament in a 360° traverse turret: in the No.1 the turret accommodated three 0.303-in (7.7-mm) Hotchkiss machine-guns in ball mountings, and in the No.2 one 3-pdr (47-mm) gun and four Hotchkiss machine-guns including one for anti-aircraft fire. Based on 0.5-in (12.7-mm) armour and weighing 19,600 lb (8891 kg), the Vickers Tank was powered by an 86-hp (64.1-kW) engine and proved mechanically unreliable. 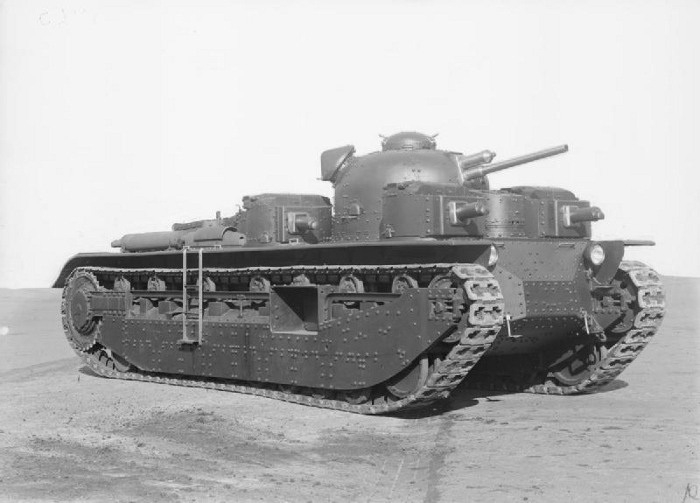 Experience with the Vickers Tank was important for the company, however, and its next design was a winner, and one of the most notable steps in the evolution of tank design: the new vehicle was the world’s first fast tank, allowing the type’s use in the manoeuvres that validated the tactical and operational concepts originating from Fuller and Liddell Hart, the body was located above the tracks so that adequate armament could be located in a revolving turret without loss of fields of fire, and reduction of length and weight thus achieved allowed higher performance on the same power as earlier tanks. Designed in 1922 as the first British tank of genuinely post-war concept, the five-man Light Tank Mk I was redesignated the Vickers Medium Tank Mk I after the army’s decision to buy the Carden-Loyd/Vickers Mk VIII (the Light Tank Mk I). The 26,325-lb (11941-kg) Medium Tank Mk I entered production in 1923 and service in 1924, and in its various forms was built to a total of about 160 machines that formed the mainstay of the Royal Tank Corps in the later 1920s and early 1930s, and remained in service until the period just before World War II. The Mk I was the first British service tank to have a 360° traverse turret and geared elevation for the main armament, and is also notable for the high speed made possible by the sprung suspension and the 90-hp (67.1-kW) Armstrong-Siddeley petrol engine: officially 16 mph (25.75 km/h), this speed was in reality only just under 30 mph (48.3 km/h). The armour was to a 6.5-mm (0.26-in) basis mainly of riveted plate, resulting in a boxlike hull in which the driver was located at the front of the vehicle next to the engine. The other four crew members were located in the fighting compartment and turret to deal with command, operation of the radio, and the handling of the armament. This had both advanced and obsolescent features: on the advanced side was the powerful 3-pdr (47-mm) Mk 1 L/31.4 main gun, a 217-lb (98.4-kg) weapon firing a 3-lb (1.36-kg) shot with a muzzle velocity of 1,750 ft (533 m) per second to pierce 25 mm (1 in) of armour angled at 30° at a range of 500 yards (457 m); and on the obsolescent side was the secondary armament, comprising four 0.303-in (7.7-mm) Hotchkiss guns in the turret plus a pair of 0.303-in (7.7-mm) Vickers guns in the hull sides. Given the type’s longevity of service, it is not surprising that the basic machine was developed into variants with a number of mechanical and operational improvements. First of these, appearing in 1924, was the Medium Tank Mk IA with slightly thicker armour, increasing weight to 26,655 lb (12091 kg), and a revised secondary armament arrangement, including an anti-aircraft mounting on a newly bevelled turret rear. The Medium Tank Mk IA* was basically similar to the Mk IA but fitted with a 0.303-in (7.7-mm) Vickers co-axial machine-gun and a commander’s cupola on the turret. The Medium Tank Mk I ICS was the infantry close support version, the standard 3-pdr ordnance of the gun tank being replaced by a 3-in (76-mm) Mk 1 L/25 howitzer, a 256-lb (116.1-kg) weapon firing its 13.75-lb (6.24-kg) projectile to a range of 2,000 yards (1830 m). There were also two experimental variants, in the forms of the Medium Tank Mk I (Ricardo C.I) and the Medium Tank Mk I Wheel-and-Track: the former was powered by a 90-hp (67.1-kW) Ricardo Diesel engine, and the latter had nose- and tail-mounted wheels. These were twin-wheel units power-lowered (via a gearbox take-off) in about one minute, the object being to reduce track wear by removing them from road contact whenever possible. In 1925 Vickers-Armstrongs introduced the improved Medium Tank Mk II with armour on an 8.25-mm (0.325-in) basis for improved protection at the penalty of a weight increase to 29,575 lb (13415 kg), the longer 3-pdr (47-mm) Mk 2 L/40.05 gun with an additional 100 ft (30.5 m) per second of muzzle velocity for slightly more armour penetration, the driver located farther forward for better fields of vision, and the suspension protected by skirt armour. Variations on this basic theme were the Medium Tank Mk II* with a Vickers co-axial machine-gun and no turret-mounted Hotchkiss machine-guns; the 1932 Medium Tank Mk II** produced by converting Mk II tanks to a standard approximating that of the Mk II* but with the addition of an armoured radio installation and a commander’s cupola; the 1930 Medium Tank Mk IIA with a number of detail improvements and revised tracks; the Medium Tank Mk IIA* basically similar to the Mk IIA but with radio in an armoured installation; the Medium Tank Mk IIA Close Support based on the Mk IIA but with a 3-in (76.2-mm) howitzer in place of the gun tank’s 3-pdr (47-mm) quick-firing gun; and the 1931 Medium Tank Mk II Command with a fixed turret (complete with dummy gun barrel) carrying additional radio equipment. There were also tropical and bridge-carrier versions, and for the USSR a small number of ‘English Workman’ tanks were built to a standard similar to that of the Mk IIA. As the Medium Tank Mk II was entering service, Vickers-Armstrongs was involved during 1925 in the design of the Vickers Independent Tank that pioneered a number of advanced features and had a profound effect on tank design outside the UK. This tank inaugurated the new British system of tank nomenclature, being officially designated the A1E1, and was delivered to the Mechanical Warfare Experimental Establishment in 1926 for exhaustive trials that did not lead to a production order because of financial restrictions rather than any major problem with the tank itself. Amongst the Independent Tank’s more advanced features were intercommunication between the eight-man crew by throat-mounted laryngaphone, a long wheelbase with the hull built up between the suspension assemblies, hydraulically powered controls and wheel steering for all but the sharpest turns. For its time the Independent was a massive machine, weighing 70,560 lb (32006 kg) and measuring 25.42 ft (7.75 m) in overall length. Power was provided by a 398-hp (267-kW) Armstrong-Siddeley petrol engine for a maximum speed of 25 mph (40.2 km/h), and the armour varied in thickness between 13 and 28 mm (0.51 and 1.1 in). Most unusual (and widely copied largely in Germany and the USSR) was the armament system, which comprised one main turret with four subsidiary turrets clustered round it. The main turret was fitted with a 3-pdr (47-mm) Mk 2 gun and incorporated a cupola for the commander, whose laryngaphone communication with all other crew members was complemented by a pointer system to indicate targets to any of the turrets. The subsidiary turrets were each fitted with a single 0.303-in (7.7-mm) Vickers machine-gun. Elements of this innovative machine were evident in the two other British medium tanks of the period between the world wars, namely the A6 and the A7. Only prototypes of the A6 were built between 1928 and 1930 with engines ranging from a 180-hp (134-kW) Armstrong-Siddeley petrol engine (A6E1) and a similarly rated Ricardo C.1 Diesel (A6E2) to the 500-hp (373-kW) Thorneycroft RY-12 Diesel. The tanks were well armoured, fitted as standard with radio and protection against gas attack, and armed with three turrets: the main turret accommodated one 3-pdr (47-mm) gun and one 0.303-in (7.7-mm) Vickers co-axial machine-gun, and each of the two forward-mounted subsidiary turrets accommodated twin Vickers guns. The production version was to have been the Medium Tank Mk III, of which three prototypes were built in 1930 with a number of improvements and reduction of the secondary armament to three machine-guns. The A7 was an official design by the Chief Superintendent of Design for construction at the Royal Ordnance Factory, Woolwich. The first two examples were the A7E1 (3-pdr/47-mm main gun plus two Vickers machine-guns) and A7E2 (2-pdr/40-mm main gun plus two Vickers machine-guns), and trials confirmed that the basic design was excellent. There were a number of mechanical failings, though, and by the time these had been overcome in 1936 the design was obsolescent. Similar mechanical problems dogged the 1937 trials of the single A7E3, which was based on the A7E2 but powered by twin AEC diesels and incorporated features of the A6E3 and Medium Tank Mk III. Up to the early 1930s the British had remained confident that they had the right ‘mix’ of armoured vehicles in the form of the light tank for reconnaissance, and the medium tank for independent mobile operations and support of the infantry. But when the failure of the A6 and A7 programmes coincided with the realization of a rapid rearmament programme forced by Germany’s growing strength and belligerence, the army decided that it could best cater for the independent mobile and infantry support roles with different tank types. Thus the medium tank gave way to the cruiser tank for mobile operations and the infantry tank for support operations. In response to the quest for intoomafirn pertaining to the WWI ‘tank’ locomotive:The tank/loco is Lionel #203, is suspect Type 1 from 1917. Type 1 was olive (as yours) and had Lionel Manufacturing Company on the bottom tag (as yours). Type 2 were battleship grey, and Type 3 (1918 through 1921) were grey with a Lionel Corporation tag. Your #203 Type 1 is very rare, indeed, with a hefty price suggestion in the Lionel guides. 2. The #203 was teamed up with a pair (2) of the #900 Ammunition Boxcars to constitute freight set #214, which I believe is what you have, circa 1917 or 1918. The ammo boxcars were grey (rather than olive), I think confirmed by your first photo. Current pricing ranges from $120 (each) in good condition, to $340 in excellent condition. 3. As side notes a. The #200 ammo cars appear to be similar in form to the #800 boxcars, with the #900 being much more rare. b. The #203 loco/tank was also sold as set #215, which included a pair of baggage cars (#702), rather than the ammo cars. 4. Re: paint and finish. Absolutely do NOT attempt to strip off any paint, rust, etc. Leave as original an untouched as possible.